"I have a lot of Japanese friends, and they all rave about Pocky®. One day I decided to try them, and they were good! Of course they bought theirs, and I wanted to make my own, so I had to look high and low until finally I created my own recipe. I flavored them with tahini and a little orange zest." Combine all-purpose flour, cake flour, confectioners' sugar, and salt in the bowl of an electric mixer fitted with the dough hook. Mix together on low speed. Stir milk and yeast together in a small bowl. Mix honey and tahini together in a separate bowl. Add milk mixture and honey mixture to the flour mixture. Mix together on medium speed to form a dough. Add water, butter, and orange zest; continue mixing until dough is firm and elastic. Divide dough into 3 pieces and knead until smooth. Roll 1 piece into a rectangle that's about 6 inches long and 1/4 inch thick. Cut into 1/4-inch strips using a sharp knife. Arrange strips 1 inch apart on the baking sheets. Repeat with remaining 2 pieces of dough. Bake in the preheated oven, watching carefully, until golden brown, 10 to 15 minutes. Move over French fries--asparagus was made for dipping! These can be eaten plain, but most prefer them coated with a flavored coating. To coat with plain nuts, fruits, or other toppings: Dip room temperature sticks in simple syrup (sugar dissolved in water), then quickly roll in topping(s). Yogurt coatings and other coatings may be used too. 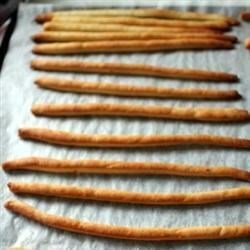 To coat with chocolate: dip sticks in tempered chocolate and let stand until set. You can sprinkle on toppings before the chocolate hardens.